how EVERY govt regulatory body overlooked agents touting “instant equity” and “great investment!” is a crime. but now that the sub-primes are dropping like flies and foreclosures are on the rise, it’s apparent the damage is done. I don’t think the damage is done. The propaganda machine is out in full force, now trying to predict the bottom. I don’t know if this is a bottom or not, but to rush somebody into buying now without understanding that the future is uncertain, is a crime. And not it isn’t common sense. People actually believe the statistics that they produce to PROVE their theory. One day somebody will sue NAR after losing their shirt. They will prove that their advertisements were misleading, had biases in the data that were not corrected (seller subsidies???). You heard it here first. Somebody will sue NAR one day. i don’t think you’re going too far out on a limb by predicting NAR on the business end of a lawsuit. some ARM holding, soon-to-foreclose lawyer w/ a litigious disposition or a major bank on the verge of losing many millions thru MBS buybacks due to defaults will blame the brokers and/or NAR… and then it’s a battle between their respective lobbyists to see who can pay off the most politicians to avoid federal scrutiny. 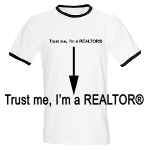 my bets on the lenders… but heck, even NAR might be able to deflect it to the appraisers. i hear they don’t have anyone representing them on the hill. Hey, I was your first client…why didn’t I get a Mr. Housing Bubble t-shirt?